Steel articles which are not protected on the surface can get serious damages because of various environmental conditions such as rain, snow, wind and extreme temperatures. These adverse environmental conditions convert iron into iron oxide and corrode steel with consequent increase in volume and decrease in strength. To avoid environment conditions acting on the steel surface various protective surface coatings are used. Out of the different types of surface coatings, galvanizing is most popular and reliable. Galvanization is the process of applying a protective zinc (Zn) coating to steel. It can be done by hot dip, electro chemical and electro deposition processes. Hot dip galvanization process is most popular method presently being used for galvanizing. The process flow of galvanization process is in Fig 1. 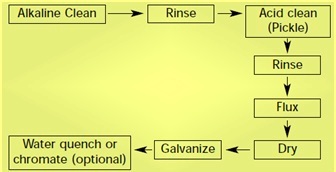 The galvanizing process consists of following three basic steps. Surface preparation – The surface preparation consists of three steps namely (i) caustic cleaning (ii) pickling and (iii) fluxing. Fluxing is done with zinc ammonium chloride. Surface preparation is an important step in galvanizing since zinc simply will not metallurgically react with steel surface if it is not perfectly clean. Any failure or inadequacies in surface preparation will immediately show after the steel is withdrawn from the molten zinc bath since the unclean areas will remain uncoated. Galvanizing – After surface preparation steel is immersed in the molten zinc bath where the steel surface is wetted by the molten zinc. The steel temperature in the bath should be in the range of 445 deg C to 465 deg C to have proper coating. The metallurgical reactions that result in the formation and structure of the zinc/iron alloy layers continue after the steel is withdrawn from the bath, as long as the steel is near the bath temperature. Inspection – The two properties which are scrutinized after galvanizing are coating thickness and coating appearance. A variety of simple physical and laboratory tests are usually performed to determine thickness, uniformity, adherence and appearance. Galvanizing forms a metallurgical bond between the underlying steel and the zinc coating thus creating a barrier that is part of steel itself. Galvanized coatings are adherent to the underlying steel at least ten times more than any other coatings. During the process of galvanizing there is a reaction between the molten zinc and the iron of steel and a series of Zn-iron alloy layers are formed as shown in the Fig 2. The figure shows a typical microstructure of the cross section of a galvanized steel coating consisting of three alloy layers and a layer of pure metallic zinc. 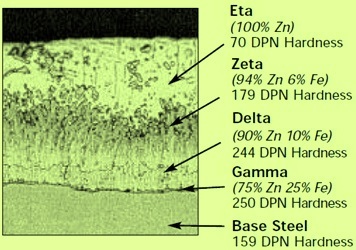 As shown in the Fig 2, the hardness of gamma, delta and zeta layers of the zinc coating as expressed in DPN (diamond pyramid number) is higher than the underlying steel. Due to this higher hardness these layers provide excellent protection against coating damage through abrasion. The eta layer of the coating being low in hardness is quite ductile and provides the coating some impact resistance. Hardness, ductility and adherence combine to provide the galvanized coating very good protection against damage during rough handling. The structure of the galvanized coating and the relative thickness of its zinc iron alloy layers have little or no effect on the protective life of the coating. Protective life depends on the total coating mass. Metallic zinc is anodic to steel. In the presence of an electrolyte, the anodic zinc coating on the galvanized steel corrodes preferentially to the cathodic steel base thus preventing corrosion of small areas which may get exposed through accidental damage to the coating. This cathodic protection continues as long as there is zinc coating. The mechanism of cathodic protection by zinc is as given below. When zinc and steel are in contact in an electrolyte, differences in electrical potential develop and an electrolytic cell is formed. Since zinc is more electrochemically active than steel, it becomes anode for all the steel, preventing the formation of small cathodic and anodic areas on the steel surface. As a result of the differences in the electrical potential within the cell, negatively charged electrons flow from the zinc anode to the steel cathode and the atoms in the anode are converted into positively charged zinc ions. At the cathode surface, negatively charged electrons attract and react with positively charged hydrogen ions from the electrolyte, liberating hydrogen gas. There is no chemical reaction between the steel cathode and the electrolyte. This phenomenon, which is known as cathodic protection, prevents corrosion of the steel cathode. The positive charged zinc ions on the anode surface react with negatively charged hydroxyl ions from the electrolyte and zinc gets slowly consumed providing sacrificial protection for the steel. When discontinuity or damage in the zinc coating exposes the underlying steel then the cathodic protection which zinc provides for the steel ensures that the exposed steel does not corrode. As the zinc coating on the steel surface solidifies, dendritic crystals grow around a core of solidified zinc, and in some cases, a flower like pattern of bright zinc crystals called ‘spangle’ forms on the surface of the galvanized steel (Fig 3). The thickness of coating is much less than the diameter of a spangle. Certain steel compositions cause the zinc iron alloy layer to grow through to the surface of the galvanized coating producing matt grey finish. In some applications the spangle pattern is considered desirable since it gives the product an attractive appearance but in case of automotive steels, the surface roughness and difference in crystal orientation associated with spangle impair the appearance of the steel after painting hence it is not desirable in such steels. For such steels extremely fine spangle pattern is needed. Spangles develop when the molten zinc adhering to the steel is cooled below the melting point of zinc (around 419 deg C). At this temperature, the randomly arranged atoms in the liquid zinc begin to position themselves into a very ordered arrangement. This occurs at many random locations within the molten zinc coating. This process of transformation is the process of solidification or crystallization. The small solidifying regions within the molten zinc are defined as ‘grains’. As individual atoms in the molten zinc attach themselves to a solidifying grain (causing grain growth), they do so in an ordered fashion and form into a distinct array, or crystal. In case of zinc, the crystals form with hexagonal symmetry. As the solid zinc grains grow larger, individual atoms of zinc arrange themselves into the often visible hexagonal symmetry of the final spangle. When the coating is completely solidified, individual spangles define individual grains of zinc. The term ‘Nucleation’ defines the process of transformation of randomly arranged atoms of molten zinc into a small organized array of atoms in the seed crystals at the initial stage of solidification. A high rate of nucleation tends to cause the formation of numerous small grains in the final solidified structure, while a low rate tends to favour the growth of large grains. There is another aspect of the solidifying process that leads to the snowflake pattern in galvanize coatings viz. dendritic growth. Dendritic growth causes the individual solidifying grains to grow into the molten zinc coating with a distinct leading rounded edge. A primary dendrite arm and secondary dendrite arms that grow laterally away from the primary dendrite arm is shown in Fig 3. Dendrites are visible in a galvanize coating because we see a two dimensional version of as cast, dendritic, solidified grain structure. The rate of growth of the dendrite arms during the solidification of the molten zinc coating competes with the rate of nucleation of new grains within the molten zinc. This process determines the final size of the completely solidified structure. 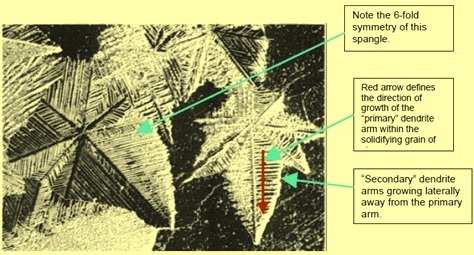 In Fig 3 there is a well defined large spangle pattern which shows that the rate of dendrite growth dominated the solidification process leading to a small number of large spangles. The characteristics of such spangles is that they are thickest at the centre and thinnest at the edges (grain boundaries) and hence difficult to smoothen by temper rolling. On the other hand Zinc coatings with smaller spangles have less depressed boundaries and can be smoothen by temper rolling. The nature and rate of dendritic growth during the solidification of molten zinc is greatly influenced by other metallic elements present in the molten zinc. In earlier days zinc coatings contained as much as 1 % lead. During the past 40 years, the percentage of lead has been brought down. Typical concentration of lead these days has been less than 0.15 %, often as low as 0.03 % to 0.05 %. Even this lower amount of lead is still sufficient to develop dendritic growth behaviour during the solidification process. Presently lead level in the range of 0.05 % to 0.10 % in the molten zinc bath is kept to achieve a well developed spangle pattern. As now there are now environmental concerns about the use of lead, practices have been developed to use lead free zinc and to add a small amount of antimony in the molten zinc bath (0.03 % to 0.10 %) for achieving well developed spangle pattern. In case of lead bearing zinc for getting smoother coating, it is possible to suppress spangle growth by rapidly cooling the coating. This is done by the use of a spangle minimizing device above the zinc bath. These devices direct steam or zinc dust at the surface to rapidly freeze the molten zinc and keep the spangle small. Such technology is not needed in case lead free zinc (lead content usually less than 0.01 % and often less than 0.005 %) is used. Lead free coatings give a spangle free surface which provides a high quality finish needed by the automotive and appliances industry. Lead free coatings have a grain pattern which is barely visible to the unaided eye. Typically the spangles are 0.5 mm in diameter. In such coatings, the grains do not grow by a dendritic mode but by a cellular mode of growth. The grains nucleate on the steel surface and grow outward towards the free surface. Absence of large spangles makes the steel surface shiny and the grain boundary depressions do not exist. Non spangle coating combined with temper rolling makes the steel very smooth which can be painted to give a very smooth finish. It is not easy to produce non spangle coatings free of lead or antimony because of their influence on the viscosity of the molten zinc. It is difficult to avoid sag and ripples in the zinc coating due to higher viscosity of molten zinc when lead or antimony is not present. The thicker is the coating; greater is the tendency to form sags and ripples. However automotive and appliances industry needs thinner coating and their products are made on high speed lines which allows producers to use lead free coating baths for avoiding spangles and still attain a ripple free coating. The size of the spangle depends on zinc chemistry, cooling rate and other factors such as smoothness of the steel base. Spangles can be qualitatively classified in the following three categories. Regular spangle – They are visible multifaceted zinc crystal structure on zinc coated steel. The cooling rate is uncontrolled which produces a variable grain size. Minimized spangle – These grain patterns on zinc coated steel are visible to unaided eyes. They are smaller and less distinct than the pattern visible on regular spangle. The zinc crystal structure growth is arrested by special production techniques or inhibited by a combination of coating bath chemistry and cooling. Spangle free – Spangle free zinc coated steels are having a uniform finish in which the surface irregularities created by spangle formation are not visible to the naked eye. The finish is produced by a combination of coating bath chemistry, or cooling or both.